This vignette demonstrates how leadr improves the ensemble building workflow, and introduces some special ensemble building tools included in the package. Let’s talk about two ensemble types1. The first is the averaging ensemble. A set of models make predictions, and you average the predictions (or possibly the classification probabilities) to try to decrease the error. Here, data is split into k-folds. The model is trained on each k-1 fold, and then evaluated on each holdout. Combined, each holdout set recovers the original data set. Then those holdout predictions are now a new feature to build included in an overall ensemble. Let’s build an ensemble for the iris dataset, which is a multiclass classification dataset. Other packages such as caretEnsemble do not yet support multiclass ensembles, but leadr provides some tools to handle this situation. First, let’s build a list of models. We explicitly define the cross-validation index, because blending requires that each model is trained on the same set of folds. We can also specify additional models using caretEnsemble. We also want to evaluate the models that go into our ensemble. In general, we want to use two different criteria. First, we want to maximize accuracy, as measured by the 5-fold cross-validation that we build our models on. Second, we want to minimize the prediction correlation. 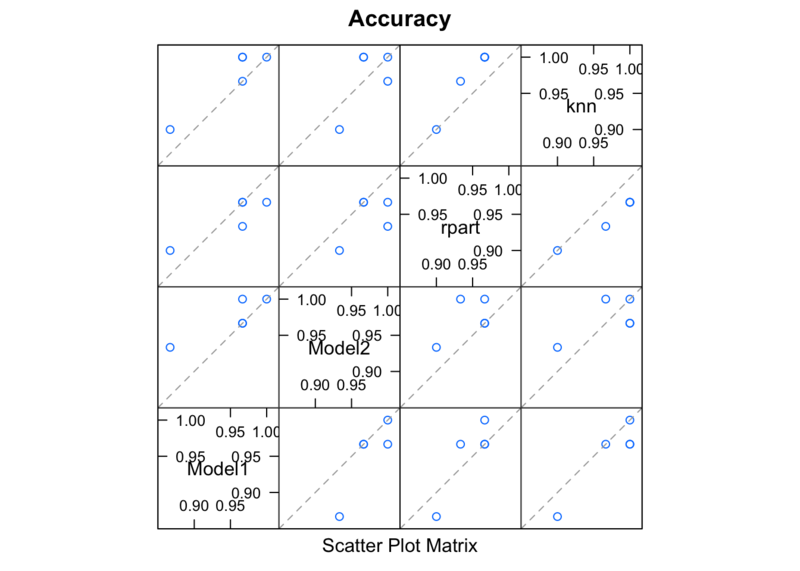 Suppose two sets of model predictions have similar accuracy scores, but are not correlated. This means that each model learned something different about the dataset, and an ensemble could combine those different understandings. Some of our models are correlated, which is to be expected for a simple data set. #> Accuracy was used to select the optimal model using the largest value. #> The final value used for the model was mtry = 2. Then we can add it to our leaderboard and see how it compares to the individual models. We’ll also take advantage of the dir argument of board. Saving this model to a new directory called ensembles allows a natural grouping of the baseline and ensemble models. leadr provides some tools to help build the ensemble, as well as keeping track of the results. We can also use the dir argument of leadr::board to create natural groupings in the leaderboard, such as base models versus ensembles.